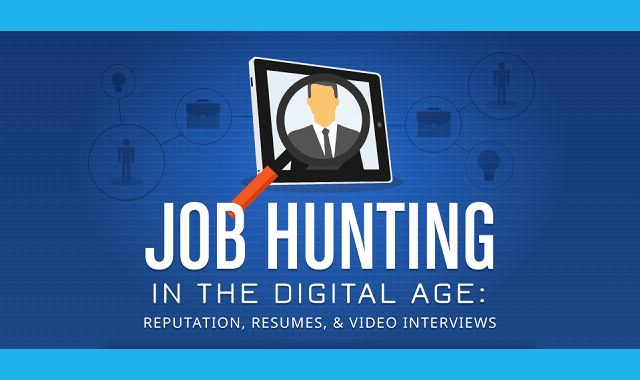 Job Hunting In the Digital Age: Reputation, Resumes & Video Interviews #Infographic ~ Visualistan '+g+"
The Job Hunting In the Digital Age infographic highlights exactly how to and not to use your online personal to enhance your digital reputation. Gone are the days when a polished resume was the tool of choice to get your foot in the door. In today’s job market, employers are screening professional networking sites like LinkedIn. They are also searching for your name on social networking sites in order to develop a well-rounded picture of potential employees. Hiring decisions are crucial for the success of their business and employers want to use all data available to make the right choice. Make sure your social online personality doesn’t betray you in a job search.